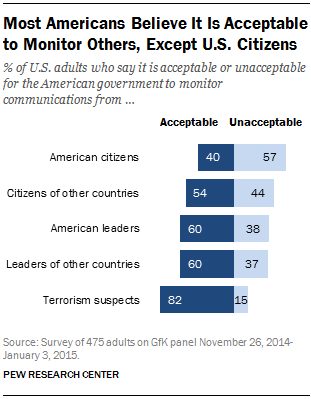 5 About half of Americans (52%) expressed worry about surveillance programs in 2014 and 2015, but they had more muted concernsabout surveillance of theirown data. 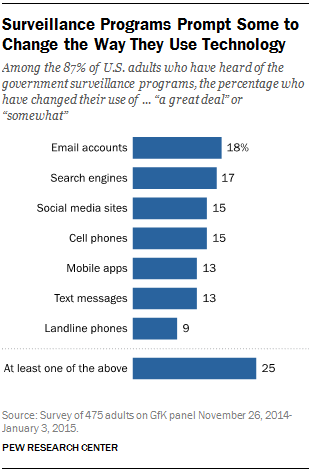 Roughly four-in-ten said they were somewhat or very concerned about government monitoring of their activity on search engines, email messages and cellphones. 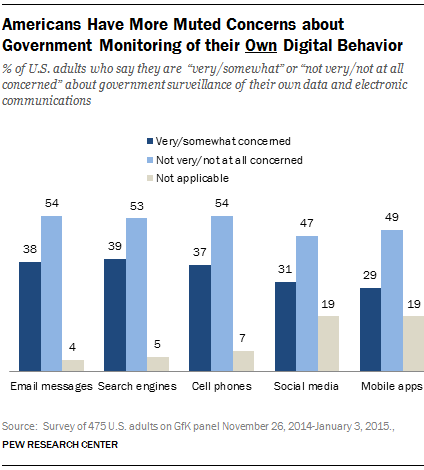 Roughly three-in-ten expressed the same amount of concern over monitoring of their activity on social media and mobile apps. Few Americans, however, said that they had a lot of control over the information that is collected about them in daily life. Just 9% of Americans said they had a lot of control over the information that is collected about them. In an earlier survey, 91% agreed with the statement that consumers have lost controlof how personal information is collected and used by companies. 8Roughly half of Americans (49%) said their personal data were less securecompared with five years prior, according to the 2016 survey. The Snowden revelations were followed in the ensuing months and years with accounts of major data breaches affecting the government and commercial firms. These vulnerabilities appear to have taken a toll. Americans ages 50 and older were particularly likely to express concerns over the safety of their data: 58% of these older Americans said their data were less secure than five years prior. Younger adults were less concerned about their data being less secure; still, 41% of 18- to 49-year-olds felt their personal information was less secure than five years earlier.